We make dog food that helps pets feel their best every day. Because it's a topic we care about a lot, we want to focus on another essential element of great pet health. That element is professional care from a vet. Just as it's important for people to go to a doctor for regular checkups even if they feel fine, dogs need to be seen by a vet on a regular basis. Vets play a central role in dogs' health, which is why we always recommend that owners take their time and find a vet they feel truly comfortable working with. But even if you personally feel great about the relationship with your vet, your dog may have different thoughts. 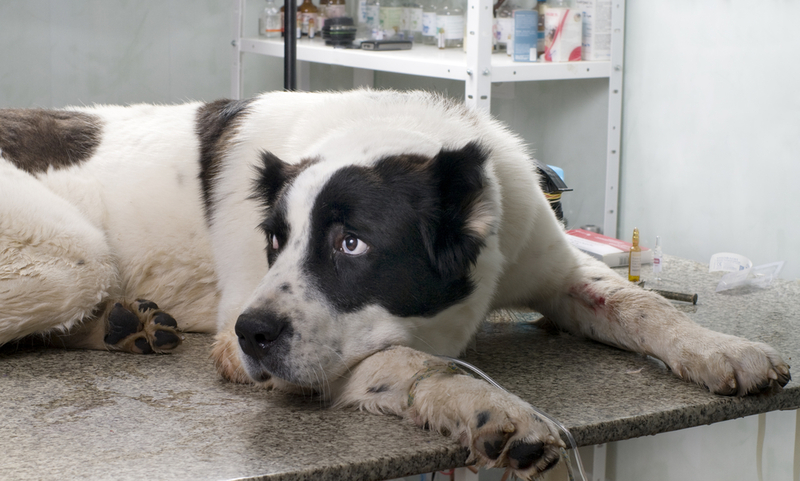 Dogs of all sizes get anxious, overwhelmed, or downright worried when they visit the vet. You want your dog to associate going to the vet with positive feelings instead of negative ones. A great way to make this happen is by always taking your dog somewhere fun like a favorite dog park after a visit. Dogs do best when they have routines to follow. One routine you can create for vet visits is giving your dog a relaxing massage. You'll want to practice this prior to the day of a visit. Practicing will give you a chance to figure out what type of touch your dog finds most relaxing. Then once you know what works best, you can apply this technique multiple times throughout a vet visit. A common source of stress during vet visits is dogs aren't used to having their mouths opened. You can reduce this source of anxiety by regularly brushing your dog's teeth. Not only will this habit make your vet visits smoother, but it will noticeably help your dog's oral health. Basic obedience commands can help a lot during a vet visit. If there are certain commands that your dog knows but may be a little rusty with, it's worth doing a little refresher work before your next vet appointment. Both dog treats and toys can help distract your dog or change its state of mind to being much happier. Having these items easily accessible when you go to the vet may be exactly what's needed to avoid any stressful situations. By making visit days a fun adventure, creating a massage routine, taking initiative with brushing, refreshing basic obedience and using toys & treats, you'll be able to make your visits to the vet a great experience for everyone who's involved. Don't simply respond to dog health issues after they happen; rather, realize what you can do to endeavor to avoid them in any case. Your dog won't just be more joyful, he'll be healthier. It is true that Dogs of all sizes get anxious, overwhelmed, or downright worried when they visit the vet. However, one can rely on CBD products to control emotions of their beloved pets. Visit CBD for Dogs and order CBD products Today. BTW if anyone interested more have a look Click Here For Visit My Site thanks"""
The cutting edge innovation enables the requests to be transported effectively over the globe today to reach in multi day or two. Give your special dog a special treat with the VitaLife Salmon and Sweet Potato Dog Food. Starting with salmon as the first ingredient, this recipe includes sweet potato, wholesome vegetables—create just the right flavor and nutrition that your dog craves. Never leave your dog in the kitchen when something is cooking. Or just get a box of store-bought snacks for your dog, so no need to cook anything. What Kind of Exercise is Best for Indoor Cats?